This topic describes how to integrate Harbor Registry with Pivotal Container Service (PKS). You must have installed PKS. For more information, see Installing PKS in the PKS documentation. You must have installed Harbor. For more information, see Installing and Configuring VMware Harbor Registry. After you install and configure Harbor, you must update the DNS entry for the Harbor hostname with the IP address of the Harbor VM assigned by BOSH. To view the IP address assigned to Harbor, click the Harbor tile and select the Status tab. PKS must authenticate connections to Harbor to pull images from and push images to Harbor. Before you can use Harbor with PKS, you must configure the BOSH Director with the CA certificate that was used to sign the Harbor certificate and private key. 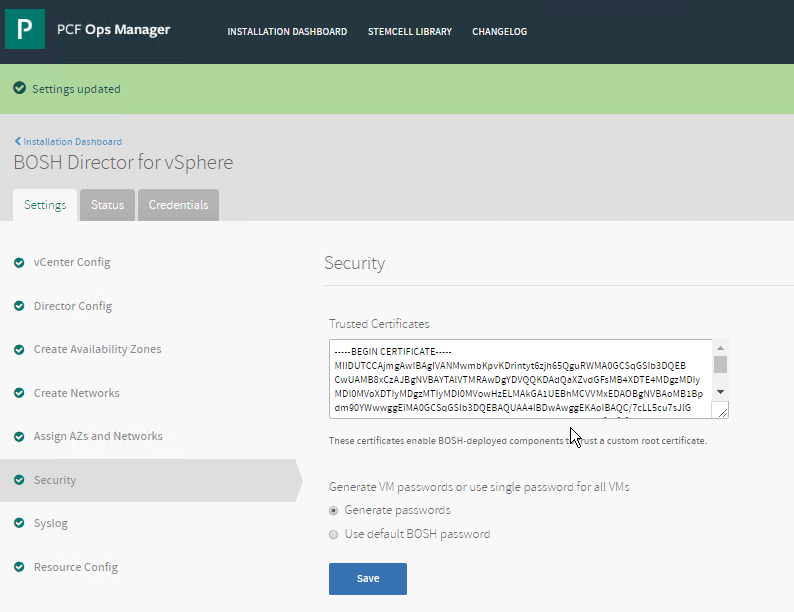 For more information, see Step 4: Configure SSL Certificate and Key in Installing and Configuring VMware Harbor Registry. By adding the CA certificate that was used to sign the Harbor certificate and key to the BOSH Director security configuration, all Kubernetes clusters deployed by PKS can automatically trust the Harbor registry. If you installed Harbor with a custom certificate and private key, follow the steps below. For more information, see Use Custom Certificate in Installing and Configuring VMware Harbor Registry. Obtain the third-party CA certificate that was used to sign the Harbor certificate and key. Import the CA certificate to the BOSH Director. 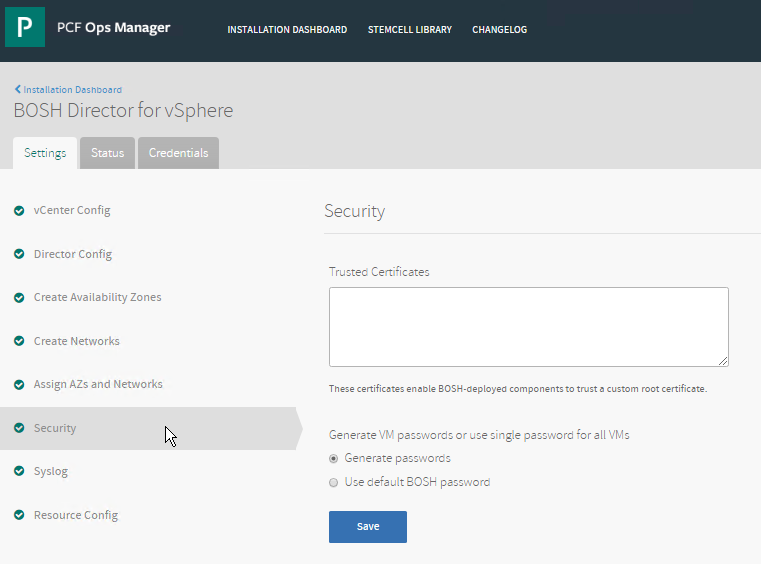 For instructions, see the Load the CA Certificate to the BOSH Director Security Configuration section below. If you had Ops Manager automatically generate the certificate and key for Harbor, download the Ops Manager Root CA Certificate by following the steps below. For more information, see Use Generated Certificate in Installing and Configuring VMware Harbor Registry. In the upper right corner, click your username and select Settings. Navigate to the Installation Dashboard. Open the CA certificate file from Obtain the Harbor CA Certificate in a text editor. 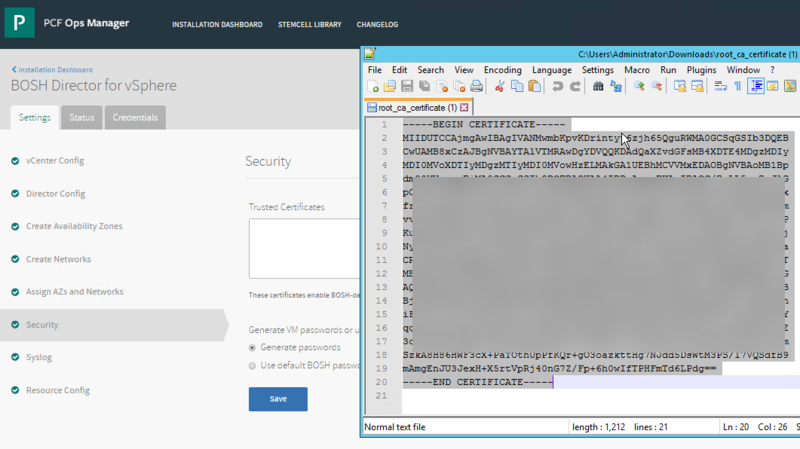 Copy and paste the contents of the CA certificate file into the Trusted Certificates field. Return to the Installation Dashboard and click Apply Changes. BOSH is redeployed. If you integrate Harbor with PKS in a NSX-T environment that uses NAT mode, the IP address for Harbor provided by Ops Manager is not publicly inaccessible, and you cannot access the Harbor UI from https://harbor_host_address:443. For more information about Nat mode, see NAT Topology in NSX-T Deployment Topologies for PKS. 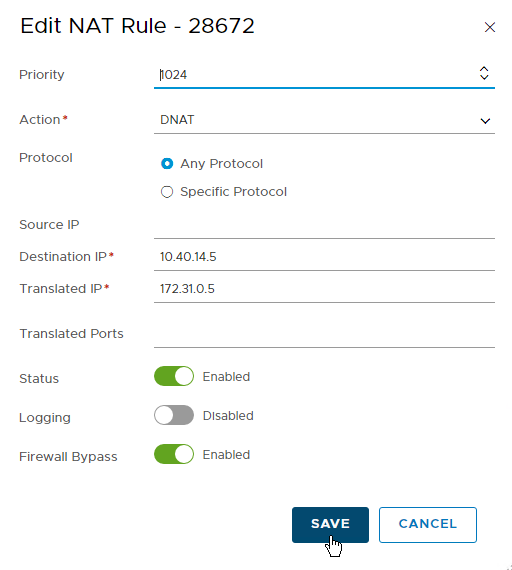 To access the Harbor UI, you must create a DNAT rule in the NSX-T Tier-0 router that maps the Harbor IP address to a routable IP address in your virtual network. For more information, see Create DNAT Rule on T0 Router for Harbor Registry in Creating the PKS Management Plane. Note: The IP address that your FQDN resolves to should be in the range of the NSX-T external-ip-pool (Inventory > Groups > IP Pools). If the IP address is not in this range, you must assign an IP address from the CIDR that is outside of the specified range in use for external-ip-pool. In the NSX Manager, select Routing > NAT > T0-Router.